A typical Mother's life would indeed be truly stressful, especially if you're a working Mom. You really have to find that perfect balance in time management as you try to juggle between your work load in the office, spend quality time for your family and doing household chores that needed to be attended to and completed, like your laundry. But thank heavens for companies such as Sharp--who understands every Mom's dilemma. The Philippines' most trusted brand in home appliances--Sharp (Phils.) Corp. --comes the unprecedented and pioneering Double Washer washing machine. 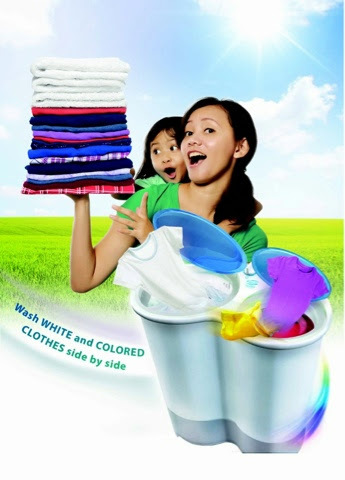 This unique product assures Filipinos that doing the laundry will now be more efficient, environment-friendly and ultimately, more convenient rather than being tedious and time consuming. With the help of the Sharp Double Washer, Moms can do the laundry easily while saving on money, time and effort. Yes, we can spend more quality time with our loved ones and enjoy life's simple pleasures. Compared to traditional washing machines that come with a “twin tub” (washer and spin dryer) design, Sharp’s version has two “washer” tubs, where you can wash both white and colored clothes at the same time. It also lets you choose which tub to use depending on your wash load, while providing up to 50% savings in washing time to save on electricity consumption. This two washer tub design also helps preserve a vital environment resource by using less amount of water in every wash. There are many ways to take advantage of the two-washer tub design. You can use the first tub for washing white clothes or delicate items like babies’ clothes and underwear, and use the second tub to wash colored clothes or heavier garments like adult clothes, office or school uniforms, and even rags, blankets or towels. This gives you the ease and speed to finish the chore in half the time you usually do. Its patented cylindrical design allows for a more efficient wash as it follows the whirl-cycle movement. It also lets you save vital house space, a feature that those living in condominiums would find beneficial. So why choose the Sharp washing machine? According to the Euromonitor International Report on Home Laundry Appliances in the Philippines, Sharp is the best-selling washing machine brand as it posted “the highest volume sales growth at 10%” in 2013. Uplifting the quality of Filipino lives for the past 32 years has been Sharp’s trademark, and is now reinforced through Sharp’s “Our Brand, Our Pride” philosophy, a commitment to bring the best products and engineering marvels to every Filipino home.